Trump said he wasn’t ‘satisfied’ with the outcome and he suspects that Kim Jong-un ‘wasn’t satisfied,’ either. The dictator demanded that all sanctions be lifted in return for giving up only some of his nukes, the U.S. president suggested. 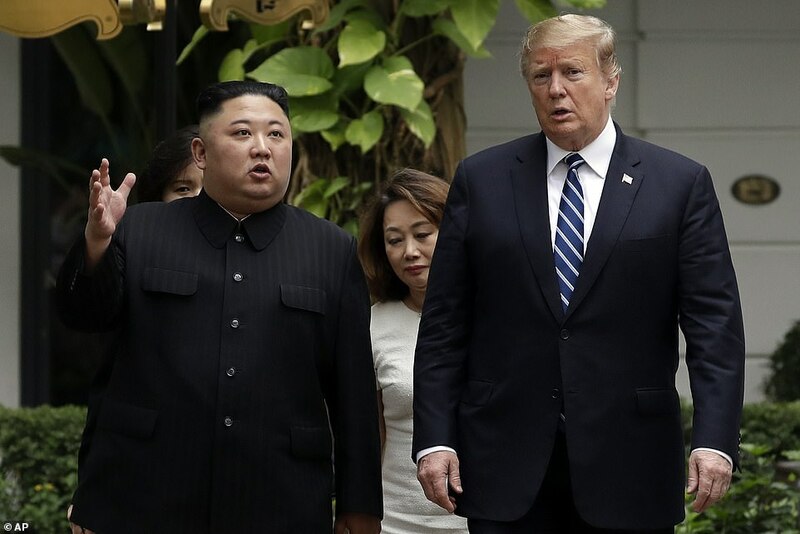 Trump said that the final snag that caused the sudden breakdown was over sanctions – and Kim’s push to have all of them lifted in exchange for a concession Trump and his secretary of state could not live with. ‘Sometimes you have to walk away,’ Trump told reporters at a press conference in Hanoi that was abruptly moved up after a breakdown in talks. At home, Democrats mocked the summit as ‘amateur hour’ and called it a ‘failure’ — with Speaker Nancy Pelosi touting Kim the ‘big winner’ for getting the president to sit down and negotiate. Trouble was brewing for Trump on multiple fronts as he flew back to the U.S. on Thursday. 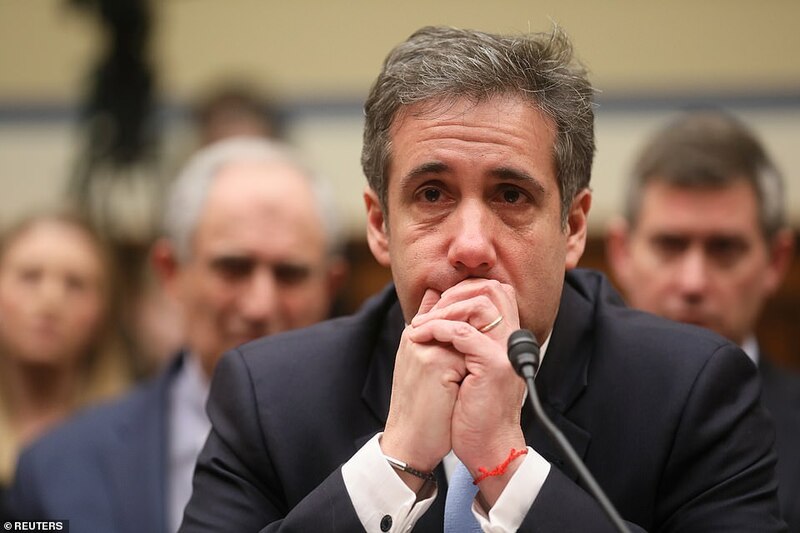 His longtime fixer, Michael Cohen, claimed in congressional testimony that Trump ordered him to silence two women threatening to go public with affairs. Cohen said that a $130,000 pay off to one of them, former adult film actress Stormy Daniels, was chump change to a billionaire like Trump. The president mostly avoided the topic at his news conference by calling on a series of members of the foreign press corps he did not recognize rather than White House reporters preparing to quiz him on the crimes Cohen claims he witnessed. Trump said he watched some of the House Oversight hearing that Cohen testified at between the hours of 10 pm and 5 am, Hanoi time. He suggested with the statement that he was up late watching Cohen, instead of prepping aggressively for his nuclear summit. 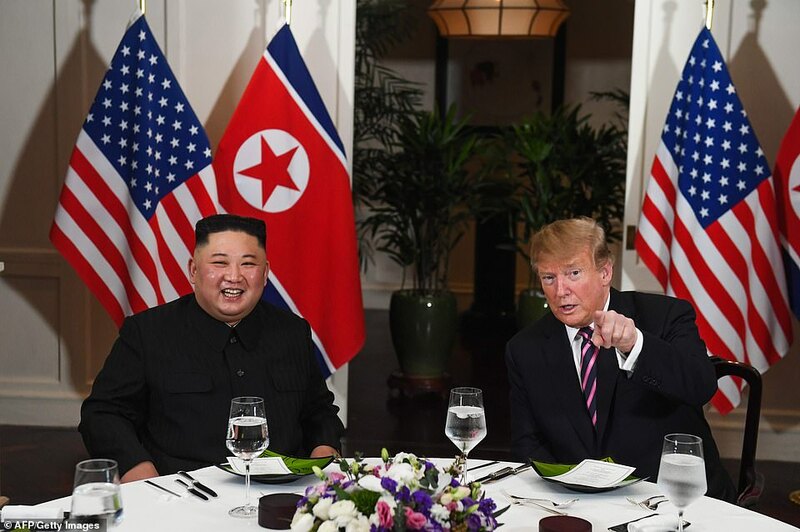 Trump said that he remains on good terms with Kim and continued to tout the ‘enormous potential’ of North Korea, not notably said there were no plans for a next summit meeting. Trump candidly revealed that Kim wanted the sanctions off, but was not willing to give up his array of nukes, missiles, and additional sites he only alluded to vaguely. ‘Basically they wanted the sanctions lifted in their entirety and we couldn’t do that,’ the president said. ‘They were willing to de-nuke a large portion of the areas that we wanted but we couln’t give up all of the sacntions for that. ‘We had to walk away from that particularly suggestion. We had to walk away from that,’ Trump said. ‘It was about sanctions. They wanted sanctions lifted but they weren’t willing to do an area that we wanted,’ Trump said. 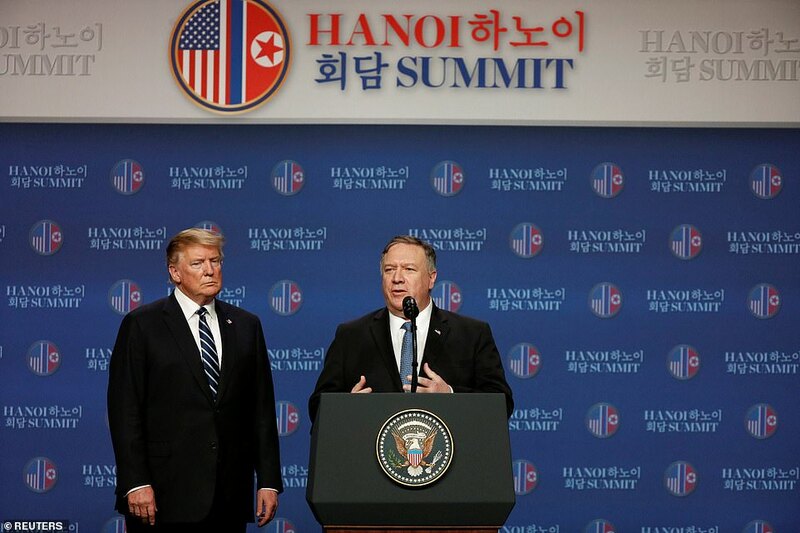 Secretary of State Mike Pompeo added: ‘We have been working for weeks to find a path forward so we could make a big step at this summit. ‘We made progress and even more progress when the two leaders met over the last 48, or 72 hours. The first signs of a rupture came when the White House suddenly made changes to the president’s schedule. A planned lunch meeting never happened, although a table was set with a floral centerpiece and menus folded inside napkins. Reporters on hand to cover it were told to move to another location. Both Trump and Pompeo said there was a willingness on both sides to keep talking, but revealed that no follow-up summit has been scheduled. He indicated that Kim was willing to make concessions related to the Yongbyon facility where his regime enriches Plutonium, but it wasn’t enough. ‘That facility while very big, it wasn’t enough to do what we were doing. We had to have more than that,’ said Trump. 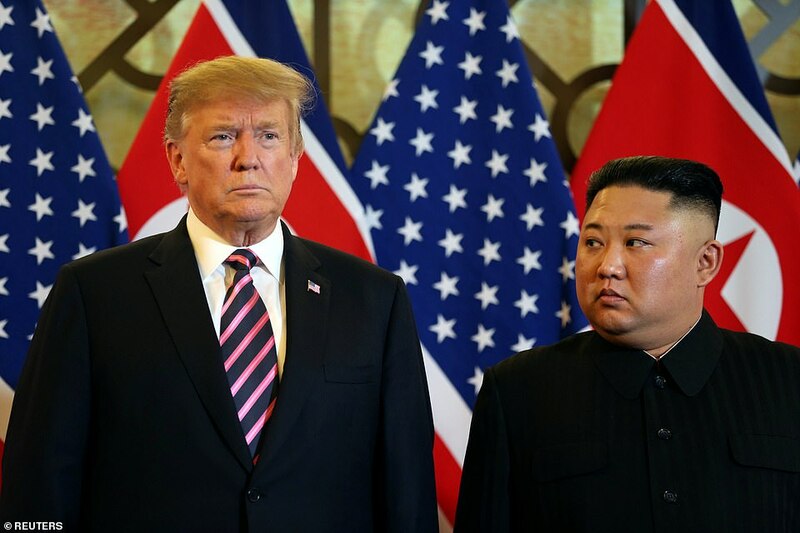 Trump said that Kim was willing to dismantle the Yongbyon nuclear research facility if the US lifted sanctions, but said Kim was unwilling to make a deal on other facilities and weapons, forcing an end to the talks. Trump’s remarks made clear there other sites the U.S. identified that Kim wanted to maintain. ‘We have that setup so we would be able to do that very easily. The inspections on North Korea will take place, and if we do something with them, we have a schedule setup that is very good. We know things … about certain places and certain sites. There are sites that people don’t know about that we know about. We would be able to do inspections we think very, very successfully,’ Trump said. Some critics had raised alarms before the summit that Trump and Kim would reach a deal that did not allow for verification. Asked whether it was premature to hold the summit now, Trump said he would ‘much rather do it right than do it fast’ and added that he ‘could have signed something today’ but didn’t feel it was the right deal. But America and North Korea remain in a position ‘to do something very special’ together, he said. The recognition that no joint statement had been reached came despite weeks of advance negotiation. A range of compromise gestures had been circulating for days in media reports. The lack of agreement came after Trump repeatedly hailed a ‘special relationship’ between the two men, and stressed their personal bond as a reason progress might be possible. 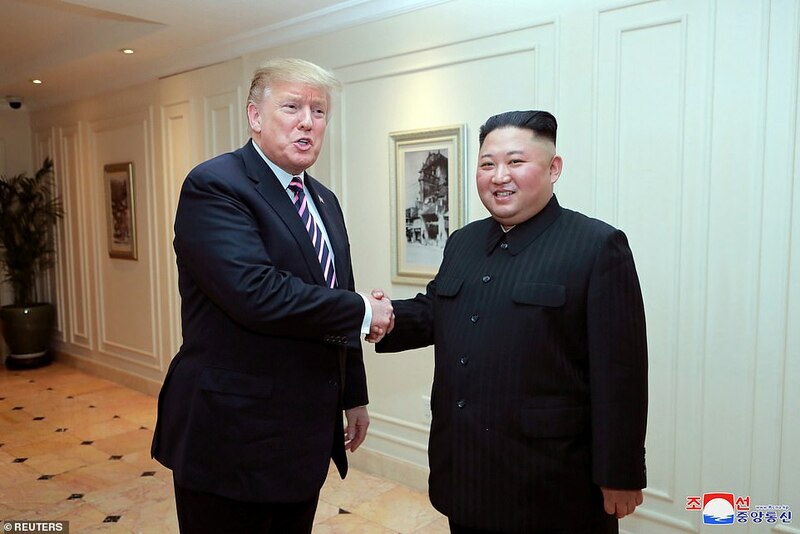 After the two men’s historic summit in Singapore in June, they both signed a joint statement – although critics blasted it for failing to include a timetable or verification members in its undefined call for denuclearization. On Thursday afternoon, Sanders suddenly told reporters traveling with the president before 1 pm local time that talks would wrap up within about half an hour, throwing the event’s schedule into turmoil. She declined to say initial there would be a signing ceremony, though one had been on an earlier White House schedule. Only minutes before Trump was scheduled to face the press did she acknowledge that there would not be one. But reporters who were on hand to cover it were relocated to buses – indicating that the event was most likely scrapped. The public White House schedule had listed a ‘Joint Agreement Signing Ceremony’ with the chairman of the state affairs commission of DPRK, set for 2:05 pm local time. Trump was to have fielded questions at 4 pm, right before leaving Vietnam, but it got moved up to 2 pm. A planned lunch between the two men was scrapped so they could ‘keep negotiating,’ Bloomberg News reported. The U.S. dollar and South Korean stock market both fell on the news that no deal had been reached. 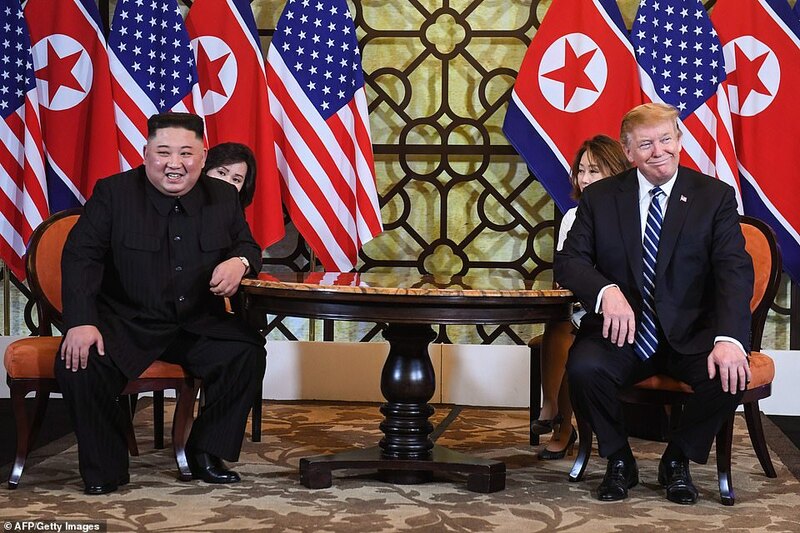 The multiple signs of tension came after a public event hours earlier where the two leaders once again smiled for the cameras – and Kim even took a few questions from U.S. media and expressed openness toward a step in normalization of relations. 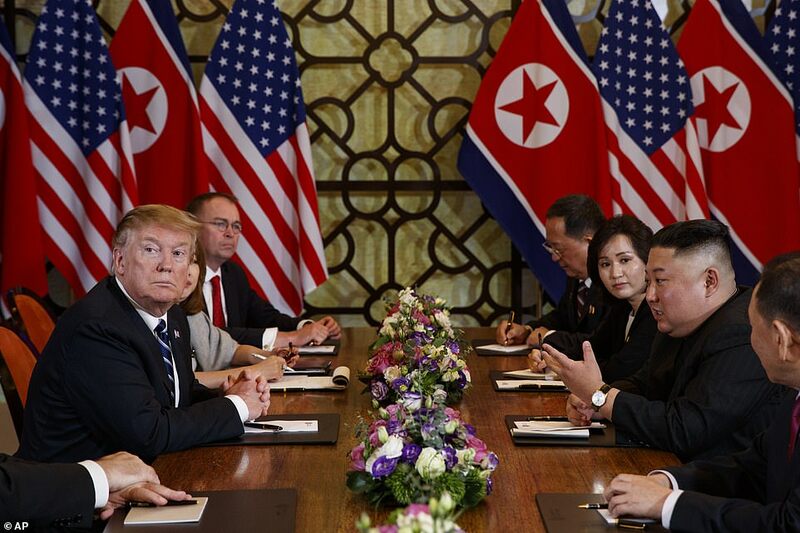 The North Korean dictator said he is open to the idea of a US liaison office in Pyongyang in a major development during the historic nuclear summit with President Donald Trump. 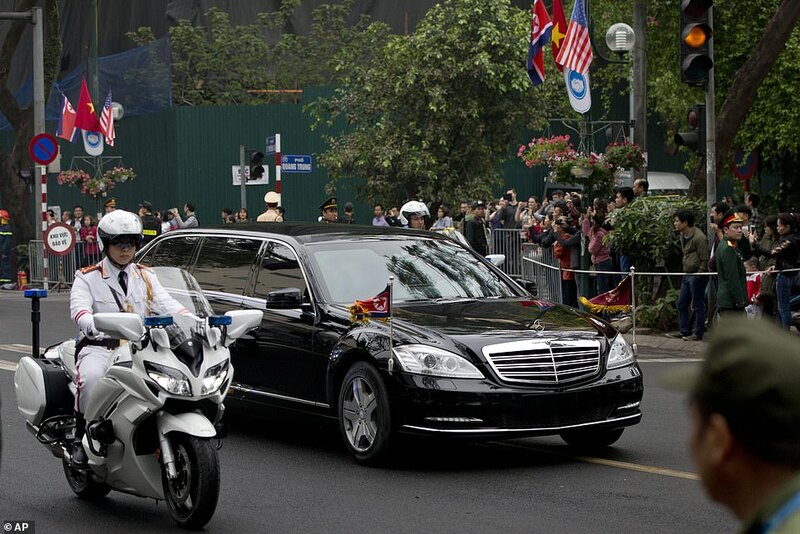 Kim revealed his stance on the issue – one of several negotiating points in Hanoi – when the absolute leader submitted to a few unscripted questions from American media members. In another comment, he revealed his stated disposition on denuclearization – although without saying what it would take to get him there. ‘If I was not, I wouldn’t be here,’ he said in his native Korean, while seated alongside Trump. 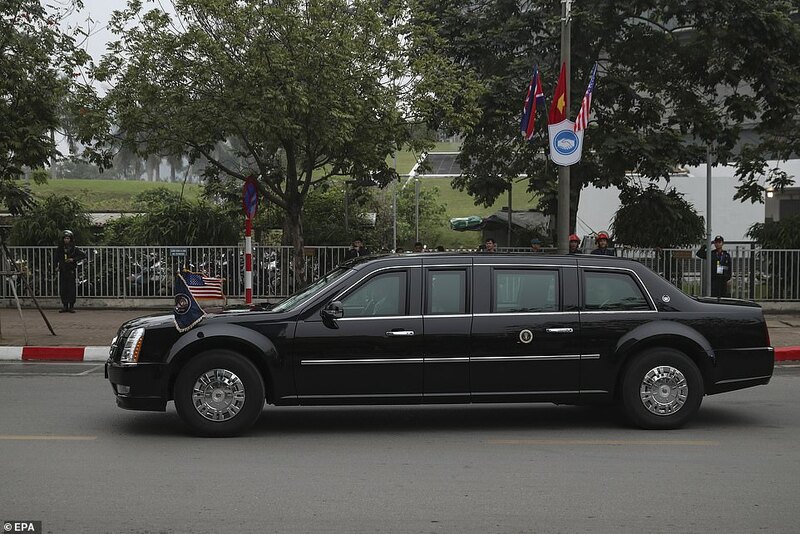 The two world leaders resumed their summit in Hanoi on Thursday morning local time – as Trump predicted a ‘fantastic success’ but Kim said it was ‘too early’ to say they would reach a deal. Trump once again asserted that he was in ‘no rush’ to make an agreement – following an early report by NBC that the US was prepared to back away from a demand that North Korea provide a full accounting of its nuclear weapons programs. 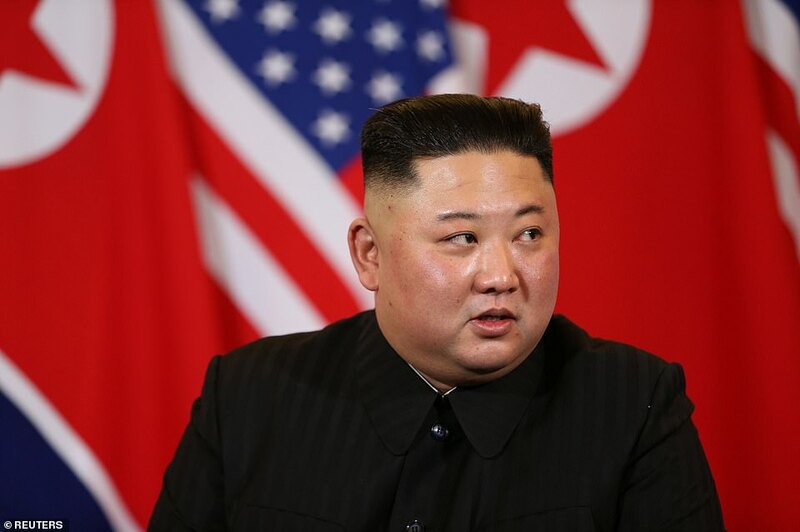 During an exchange with the media, a reporter asked Kim if he was ready for a U.S. liaison office in Pyongyang – considered a step toward normalization of relations. At first a North Korean aide tried to cut him off, but Trump – who has tangled with the press – intervened. ‘That’s actually an interesting question. I would like to actually hear that answer,’ Trump said. ‘I have a feeling that good results will come,’ Kim added. 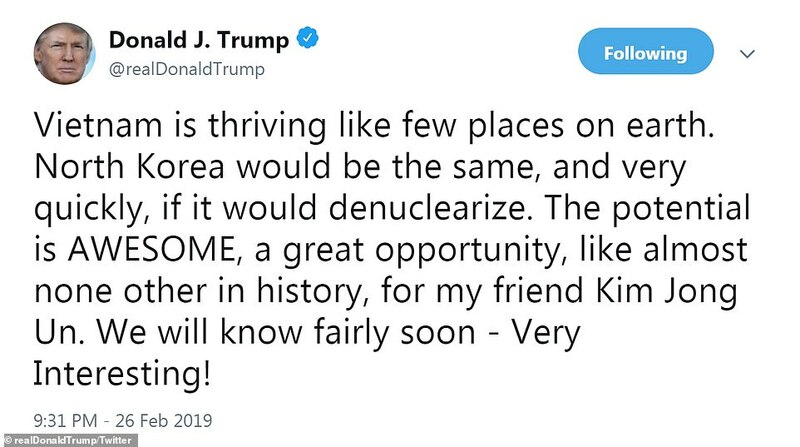 Trump also predicted spending more time with the North Korean dictator. ‘And, I’m sure over the years we’ll be together a lot, and I think we’ll also be together after the fact, meaning after the deal is made. We had very good discussions last night at dinner, and the pre-dinner was very good. And, there were a lot of great ideas being thrown about,’ Trump said. Trump once again called the relationship between the two men ‘very strong’. ‘I am in no rush. We don’t want the testing, and we’ve developed something very special with respect to that,’ Trump said, without revealing details, as the two men moved toward an expected joint statement. 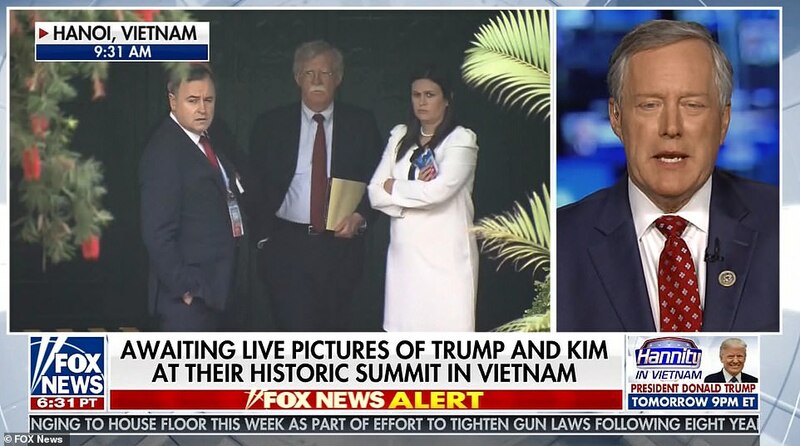 At one point after their first meeting Wednesday, the two men took a stroll by the hotel pool, with photographers ready to capture the moment. 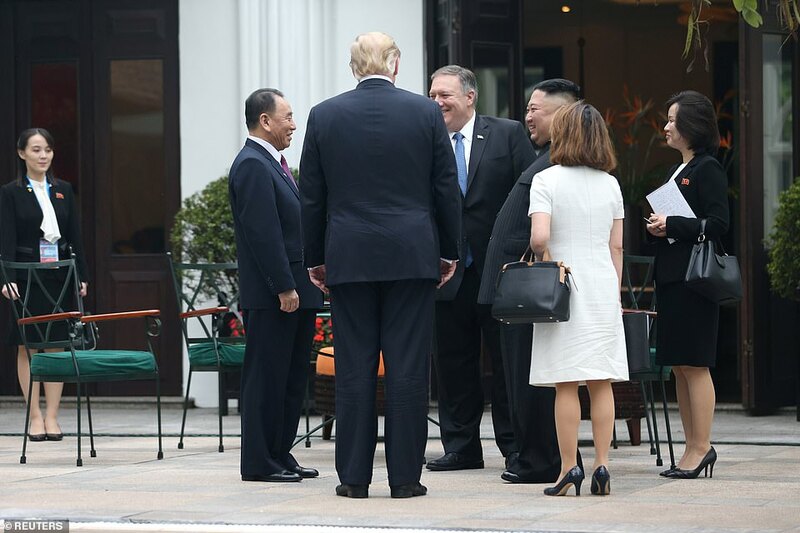 They walked along with two interpreters beneath palm trees as Kim greeted Secretary of State Mike Pompeo and general and spy chief Kim Yong Chol. Reporters covering the event passed National Security Advisor John Bolton, White House press secretary Sarah Sanders, and Trump aide Dan Scanino, who didn’t appear to be joining the second meeting with staff. Trump was back to trying his hand at diplomacy after the president’s ex-fixer Michael Cohen dominated headlines with his day of bombshell testimony against his former boss. Cohen’s appearances have shadowed the president’s appearances, and Trump even tweeted to attack his longtime fixer as a ‘liar’ shortly before he delivered bombshell testimony in the Capitol claiming Trump participated in a criminal conspiracy involving the hush payment to Stormy Daniels. 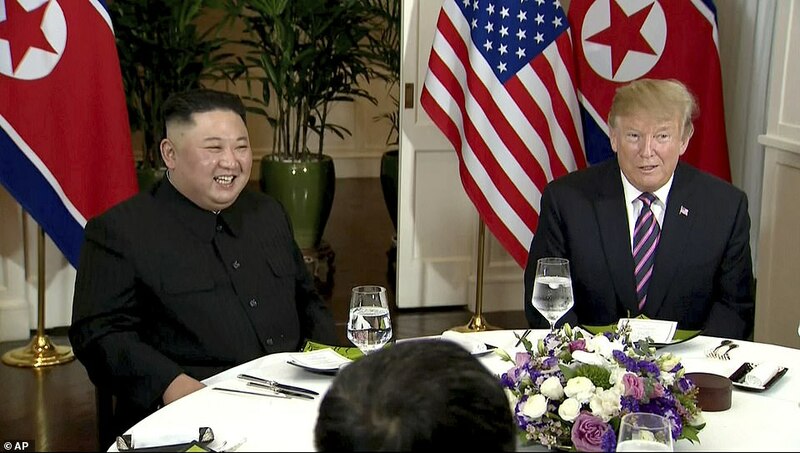 Trump and Kim met for their second time at the French colonial-era Metropole hotel, where they had dined Wednesday night. 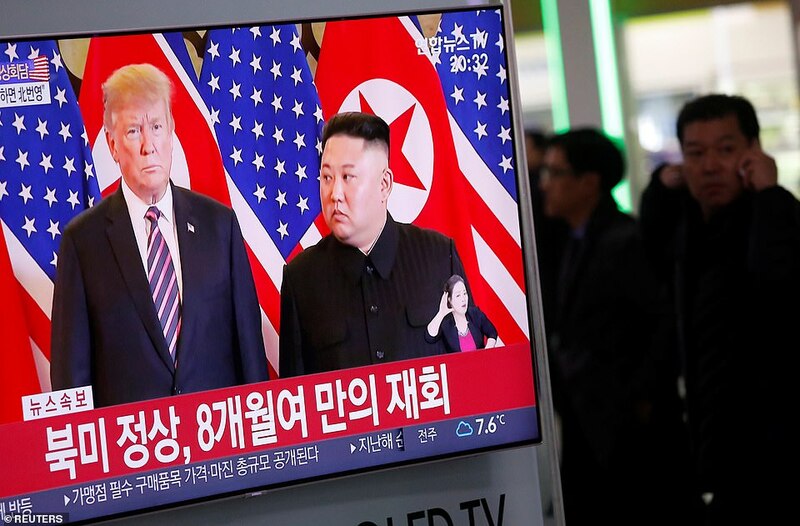 Before they sat down, NBC reported the U.S. was no longer insisting as a negotiating position that North Korea provide a ‘full accounting of its nuclear weapons and ballistic missile programs’ – which would amount to a major concession. Trump hailed ‘a very special relationship’ when he met Kim in the Vietnamese capital of Hanoi on Wednesday and said he was satisfied with the pace of talks, despite some criticism they were not moving quickly enough. ‘Great meetings’ and a ‘Very good dialogue,’ Trump said on Twitter after dinner with Kim at the French-colonial-era Metropole hotel while the White House said the two planned to sign a ‘joint agreement’ after further talks on Thursday. 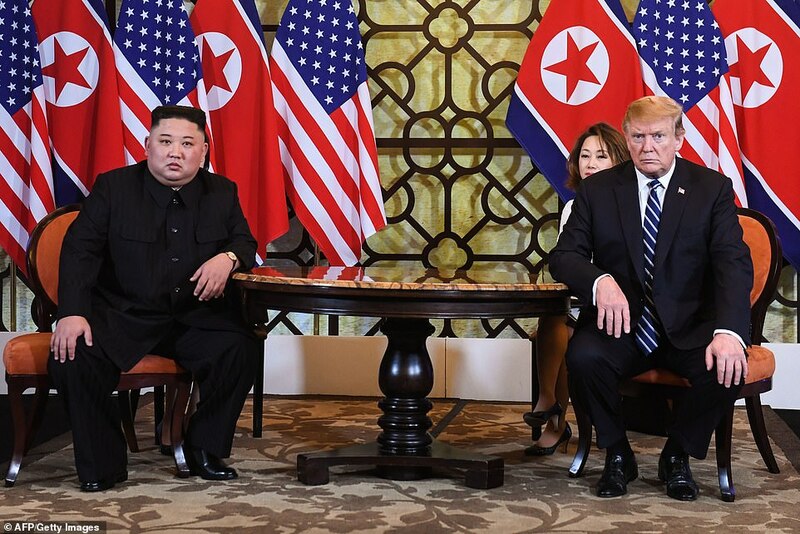 The White House has given no indication of what the signing ceremony might involve, although the two sides’ discussions have included the possibility of a political statement to declare the 1950-53 Korean War over, which some critics see as premature. 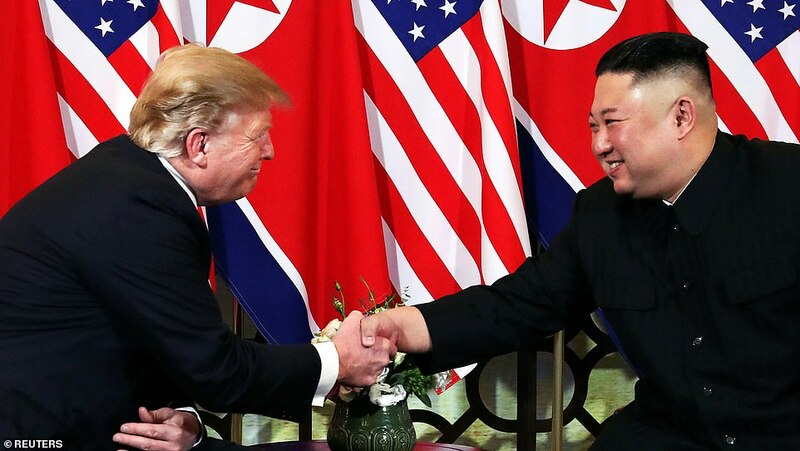 They have also discussed partial denuclearization measures, such as allowing inspectors to observe the dismantling of North Korea’s Yongbyon nuclear reactor, U.S. and South Korean officials say. 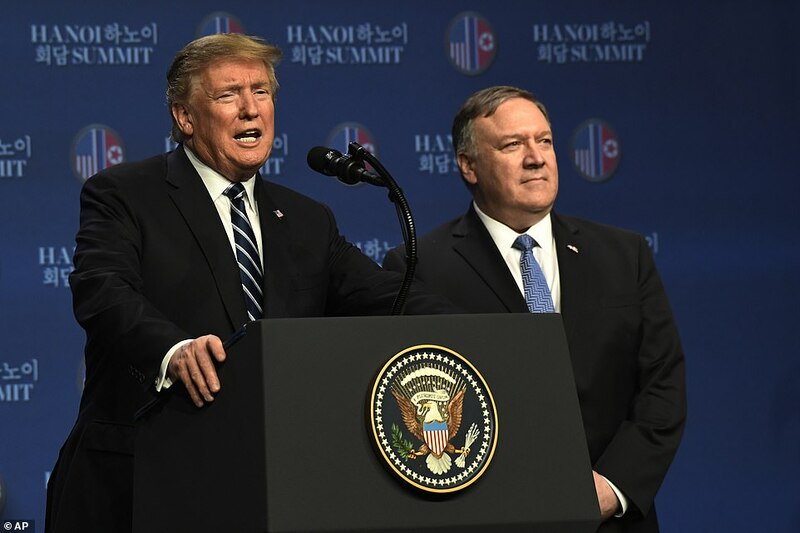 The Hanoi summit was Trump’s second with Kim since an inconclusive meeting in Singapore in June that produced much fanfare but little substance and there had been little sign of concrete progress since. The U.S. president nevertheless appeared upbeat with Kim even as his former personal lawyer Michael Cohen testified at a congressional hearing in Washington, calling Trump a ‘conman’ who knew in advance about the release of stolen emails aimed at hurting his Democratic rival in the 2016 election campaign. The leaders exchanged views at dinner with the aim of achieving comprehensive and ground-breaking results from their summit, Kim’s state news agency KCNA said on Thursday. ‘Sincere and in-depth views were exchanged to bring about a comprehensive and groundbreaking outcome,’ it said. 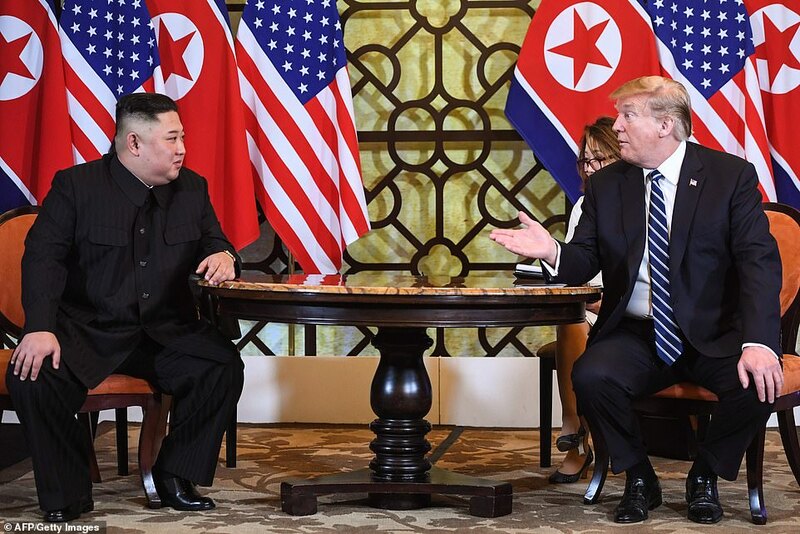 The two men had met in the Vietnamese capital in front of a bank of six flags from each nation, for the first meeting for the pair since their historic summit in Singapore in June. 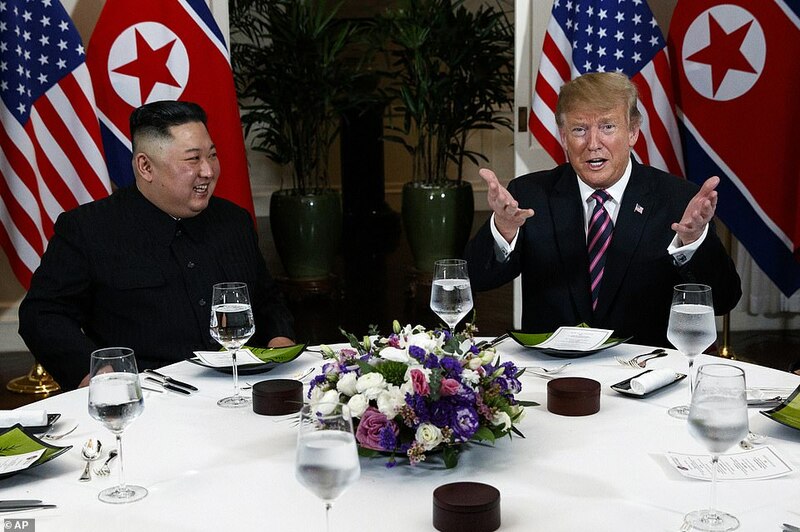 ‘It’s an honor to be with Chairman Kim. It’s an honor to be together,’ said Trump, who repeatedly praised his counterpart. The admiration may be mutual. In one remark, Kim praised Trump’s ‘courageous decision’ to open dialogue, according to how his translator recounted it. 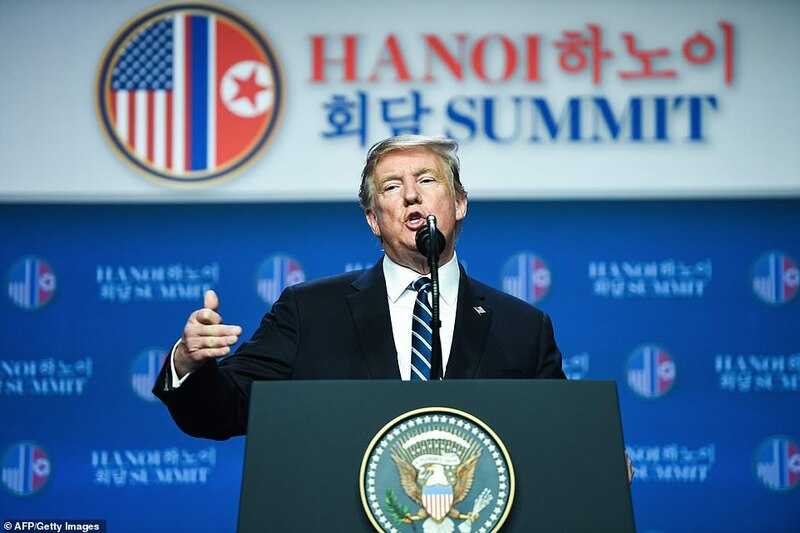 In introductory remarks, Trump did much of the talking – and one again dangled the promise of prosperity for North Korea, and addressed critics who noted their initial joint statement was vague and hard to measure. ‘I thought the first summit was a great success, I think this one hopefully will be equal or greater than the first,’ the president added. As he has repeatedly, Trump pointed to personal chemistry with the reclusive leader of the family-led one-party dictatorship – although his secretary of state says North Korea is still a nuclear threat, having tested a hydrogen bomb and months ago conducted a skein of missile tests. ‘We made a lot of progress and I think the biggest progress was our relationship is really a good one,’ Trump said. 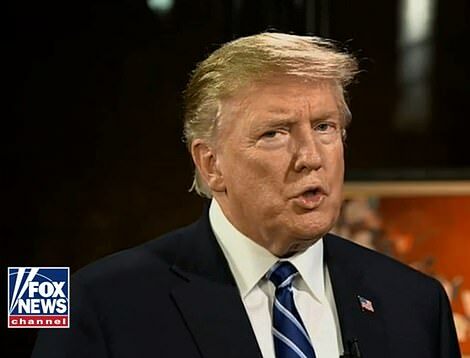 Dangling economic enticements that he hopes will persuade Kim to give up nuclear weapons his nation has been developing for years, Trump said: ‘I think that your country has tremendous economic potential. Unbelievable. Unlimited,’ Trump said, seated across from Kim. Both men smiled before cameras as they exchanged a handshake. A reporter asked Trump about former lawyer Michael Cohen’s bombshell testimony in Congress that calls Trump a ‘conman.’ Trump shook his head and didn’t respond. That may not have gone over well with the White House staff. At a subsequent photo-op, two wire service reporters were excluded, including the one who had asked about Cohen, whose bombshell testimony touched on Stormy Daniels, a Trump Moscow tower project, and Wikileaks. For that event, the two men were seated at a round table with a floral centerpiece. Their meal had not yet been served. Once again, Trump talked up their bond. ‘Our relationship is a very special relationship,’ the president said. ‘And a lot of things are going to be solved I hope. It’ll lead to really a wonderful situation long term. And our relationship is a very special relationship,’ the president said. Minutes earlier, as they first met, the two men engaged in brief remarks, then looked ahead toward press photographers with serious expressions on their faces. Eventually they smiled. ‘Thank you very much,’ Trump told reporters. 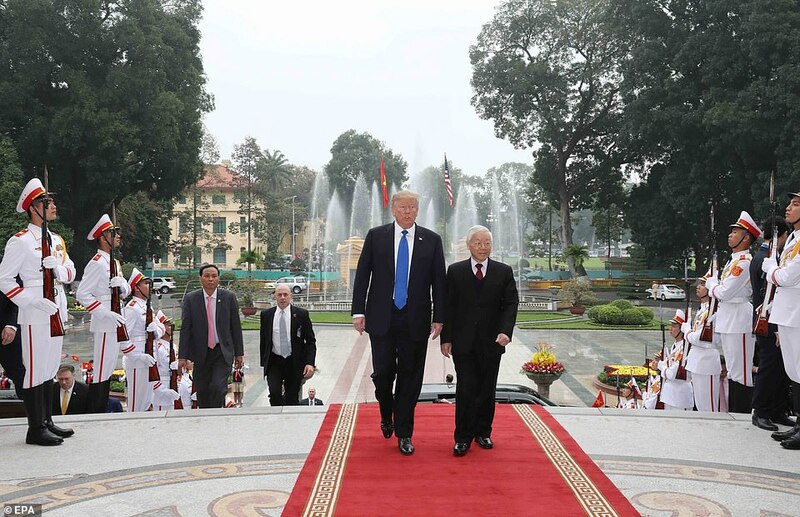 Trump began his Hanoi stay by meeting with Nguyen Phu Trong, the president of Vietnam, lavishing praise upon Vietnam for its ‘thriving’ economy and holding out the local economy as a model for North Korea to pursue. 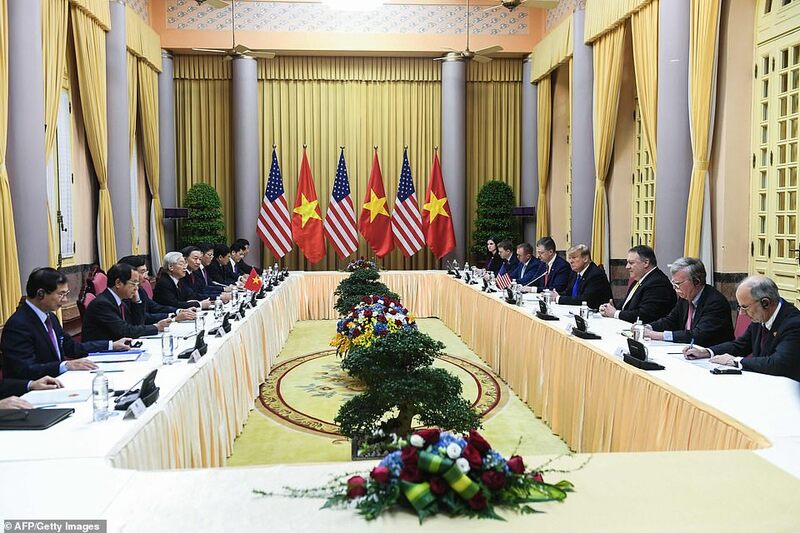 He announced a deal to have Vietnamese airlines purchase U.S.-made planes – even as it continues to ship billions worth of sneakers and shrimp to U.S. ports. Other agreements would bring the total value of the agreements to $21 billion, according to an administration official. Trump also called the relationship between the U.S. and Vietnam an ‘example’ of what can become of North Korea if it gives up its nuclear weapons. Trump also posed in front of a statue of the nation’s revolutionary founder Ho Chi Min. 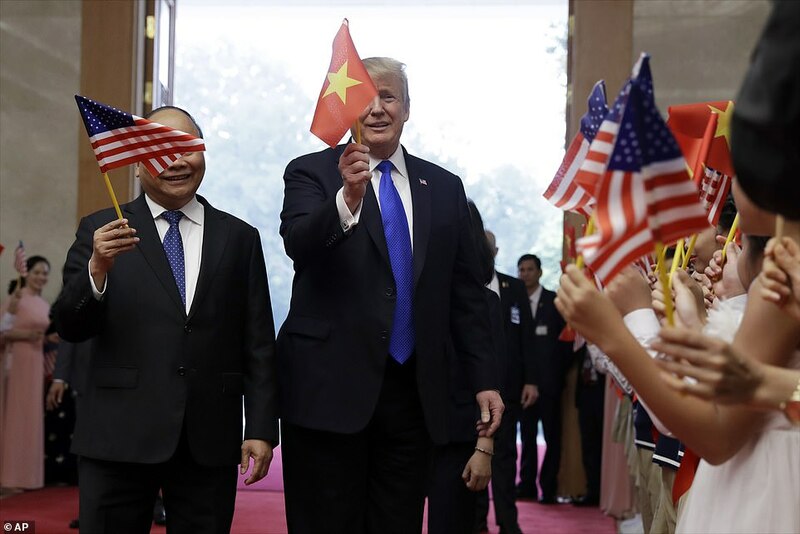 Later, Trump smiled and held a Vietnamese flag as he met with the country’s prime minister, Nguyen Xuan Phuc, and inked a series of agreements. Per capita income in Vietnam is nearly double that in North Korea, $2,400 compared to $1,300, achieving 7 per cent growth and with robust foreign investment and growing trade with the U.S.
South Korea is much farther along the development path, with per capita income of $26,000. The president is relying on his brand of personal diplomacy to try to score a breakthrough here with Kim, after failing to see progress on denuclearization after a vague letter reached after the Singapore summit. He has previously said they fell ‘in love’ at their Singapore summit, and has repeatedly stressed that the hermetic regime could become wildly successful if it modernizes and relinquishes its nuclear weapons. His bid to establish camaraderie with Kim comes despite dark signals that continue to emerge out of the closed society he governs. Kim forced his uncle to watch colleagues get blown apart with anti-aircraft guns before his own death, according to a defector. Kang Cheol-Hwan said he was told by eye witnesses that two men who worked with Kim’s uncle, Jang Song-thaek, were killed by firing squad. The two men were brought in front of a barrage of eight anti-aircraft guns and had lumps of iron stuffed into their mouths before their deaths.